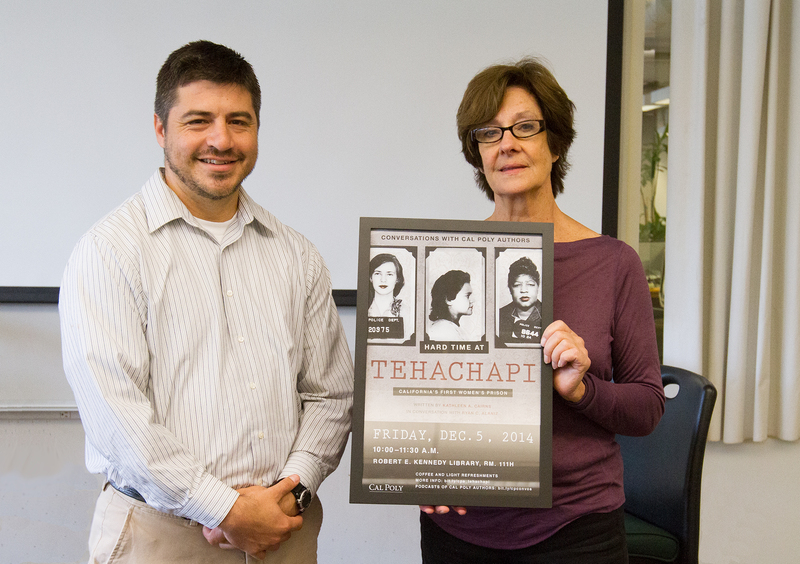 On Friday, December 5, Kennedy Library welcomed Kathleen Cairns to speak about her book, Hard Time at Tehachapi: California’s First Women’s Prison. She spoke about the first women’s prison in California, from the personal stories of the inmates to the historical significance of the prison. She was joined in conversation by Ryan Alaniz, who had just finished teaching a course that included students from both Cal Poly and San Luis Obispo County Jail. The prison was open from 1932 until 1952 and was completely run by and for women in Tehachapi, a city about 130 miles northeast of Los Angeles. As the first women’s prison in California, the goal was to rehabilitate the women so that they could have a normal, law-abiding lifestyle after they left prison. The prison was set up like a college campus. Each prisoner had their own room and was encouraged to decorate it. The women also each had a job to do, from tending to the garden to editing the prison’s newspaper to even taking care of all the cats at the prison. For the first few years, there wasn’t even a fence around the property. The staff assumed that the women wouldn’t want to escape and would just love it there, Kathleen said, eliciting a few chuckles from the audience. A fence was eventually put up. Everything that the inmates did at Tehachapi was in order to learn how to be a law abiding citizen once they got out of prison. Learning how to lead a normal life was easier for some inmates, but harder for others. “The murderers were the easiest ones. They just wanted to do their time and get out,” Kathleen said. Other prisoners, like forgers, were difficult to rehabilitate because they just went back to a life of crime after getting out. Murder was usually a one-time offense, while other crimes were more habitual. Ryan and Kathleen before the conversation. Tehachapi was started by and run by women for women. The prison was opened after years of women pushing politicians to create the prison. These women weren’t professionals; they were housewives who were members of women’s clubs or “club women” as Kathleen called them. In a way, pushing the politicians for the prison was how they got their power, Kathleen said. “I learned that these were not just bored housewives. They were professionals about what they wanted to do,” said Kathleen. By 1937, five years after it opened, there was not a man in sight. Now, women in prison are often supervised by men. However, while the women who ran the prison were empowered by their professional roles, the inmates were rehabilitated in a way that gave them little to no power. “Rehabilitation was to put the women back [in society] as housewives, but the club women were empowered women,” Ryan pointed out. “Often in the writing process I’ve changed and I was wondering how you’ve changed,” Ryan asked Kathleen. Kathleen learned a lot from writing this book. In particular, her opinion of the club women changed. She originally thought that they were just bored housewives, but has since understood they wanted to be professionals. Ryan also asked Kathleen about advice for writers, as Kathleen is the author of several books. “Just sit yourself in the chair and start writing,” she said. “I have no hobbies. Writing is my hobby,” she added. You can hear a podcast of Kathleen and Ryan’s conversation on SoundCloud. 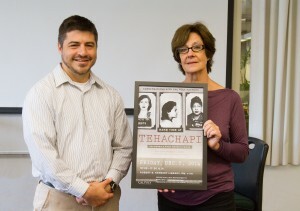 Read more on cal poly authors, conversations with cal poly authors, Hard time at tehachapi: California's first women's prison, Kathleen Cairns, kennedy library, and Ryan Alaniz.